Looking for Dental Implants in Bremerton, WA? Agape Dental Care is dedicated to your comfort when you visit our office. We strive to give you a safe place to talk about your implants. Our entire staff can help answer any questions you may have, no matter how silly you think they may be. 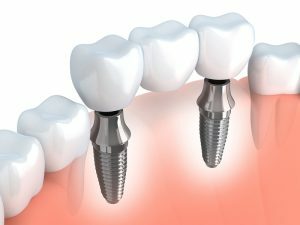 The key benefit of dental implants over other tooth replacement systems is that an implant connects directly to the jaw bone. It’s obviously not the same as the original connection, but functions just the same. When a tooth is lost, bone loss will eventually occur in that region because the root is no longer stimulating and stabilizing the bone. By using titanium–which biochemically joins to bone–to replace the root, you get a bond that more accurately replicates the one found in nature. When the implant post fully heals and fuses with the bone, about 2-3 months after surgery, an abutment is used to secure the final dental restoration.